For any knitter new to color knitting, the prospect of handling two or more strands of yarn at a time may seem daunting. Enter the magic of slipped stitches: You only one use strand at a time, while creating beautiful, intricate-looking patterns. Geometric patterns: Slip-stitch patterns lend themselves easily to patterns with straight lines and sharp corners. Patterns like this one are sometimes referred to as mosaic knitting, a term coined by Barbara Walker. Walker’s extensive explorations of the technique provide excellent further reading. Rounded patterns: Slipped stitches can also make patterns with curved-looking or “bent” edges. It’s hard to believe that these are basically just stripes. Hand-painted yarns: The irregular, painterly quality of hand-dyed yarn lends itself beautifully to slip-stitch patterns, adding depth and dimension to the knitted fabric. 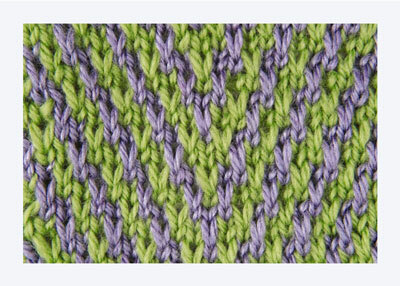 Variegated yarns: Slipped stitches have the unique ability to highlight different areas of variegated yarn strands. Notice how the slipped stitches cause certain colors to pop out visually. Mill-dyed yarns: The saturated even tones of commercially dyed yarns provide a reliable and predictable outcome in slip-stitch patterns. These yarns are the best to use when you want full control over where and how each color appears. 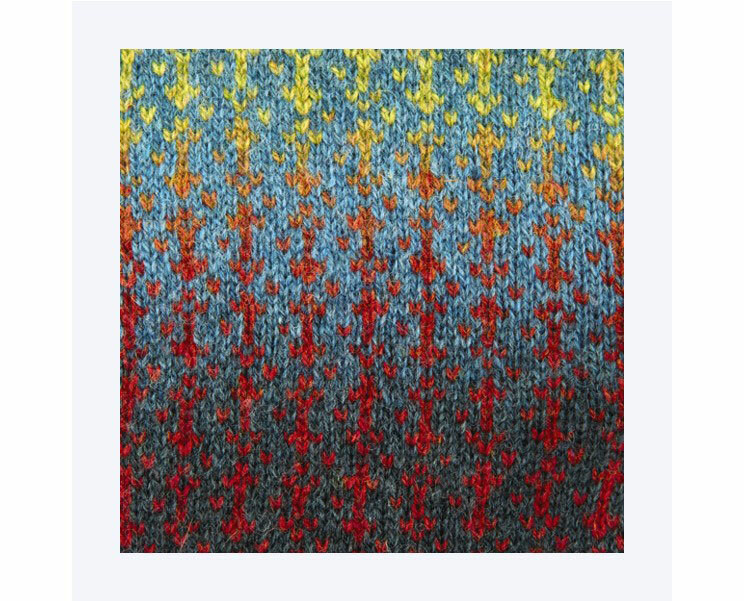 Color-changing yarns: Relinquish control over the color placement by choosing a long-repeat self-striping yarn, and the results will surprise and delight you. 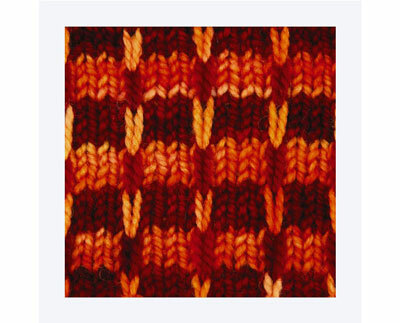 The subtle shifts in color in these yarns are highlighted beautifully in slip-stitch patterns. Slip-stitch patterns are simple to work because they repeat at predetermined intervals, and because you knit with only a single strand of yarn at any given time. 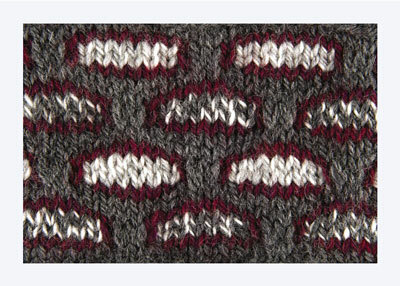 In the basic slip-stitch pattern, the stitch is passed from the left needle to the right needle without being knitted. This causes different colors from prior rows to be pulled up into the current row. You create different effects by holding the working strand either in front of the work (wyif = with yarn in front, as above) or behind it (wyib = with yarn in back, as shown here). 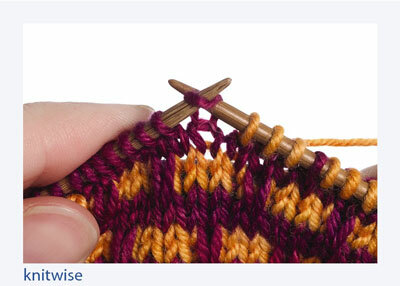 To slip purlwise, insert the right needle into the stitch as if to purl, then move it to the right needle. 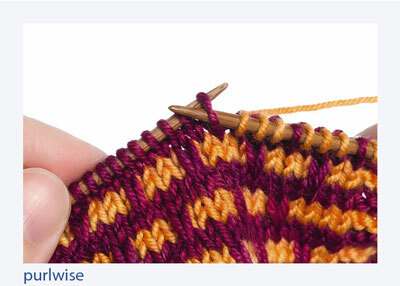 To slip knitwise, insert the right needle into the stitch as if to knit, then move it to the right needle. Slipping stitches creates a fabric that is more compressed vertically. Make swatches to determine the gauge that creates the best fabric: neither too dense nor too loose. 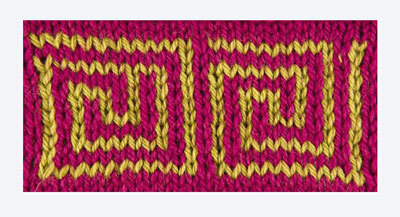 Slip-stitch patterns may be worked either circularly or flat. 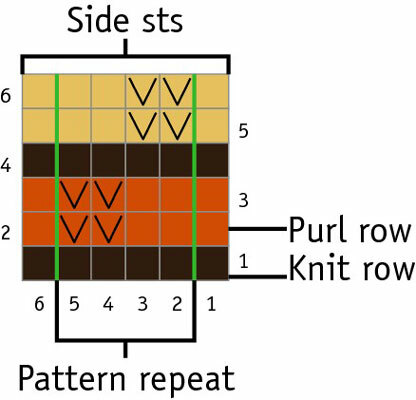 You can convert a pattern charted for flat knitting to circular knitting by reading all chart rows, including the wrong-side ones, as right-side rows. You also need to eliminate any edge stitches called for in flat knitting so that the pattern repeats evenly across the round. 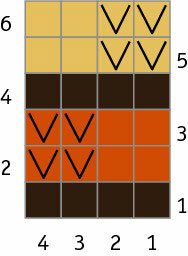 This chart for flat knitting calls for edge stitches that center the pattern repeat on the flat piece. The odd-numbered rows are knit (on the RS), and the even-numbered rows are purled (on the WS). 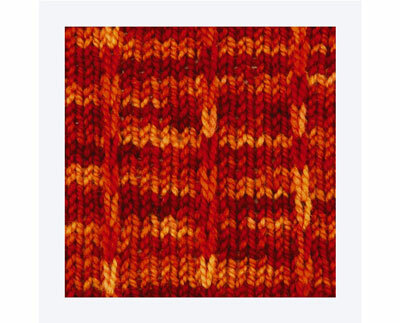 The same pattern used for circular knitting would look like this. The edge stitches are eliminated, and all rounds are knitted. When working circularly, read charts and directions carefully for actions meant to be taken on the wrong side of the work. Make notes for yourself so you don’t forget them now that your circular knitting has no wrong-side rows.